Some days, my kids will have home-baked treats for breakfast. It can be scones, muffins, or quick breads. Well, remember the Cream Scones With Chocolate recipe I posted earlier? The cream and flour ratio in that recipe worked so well it prompted me to tweak the recipe a little and bake this lovely Cheddar Scones. 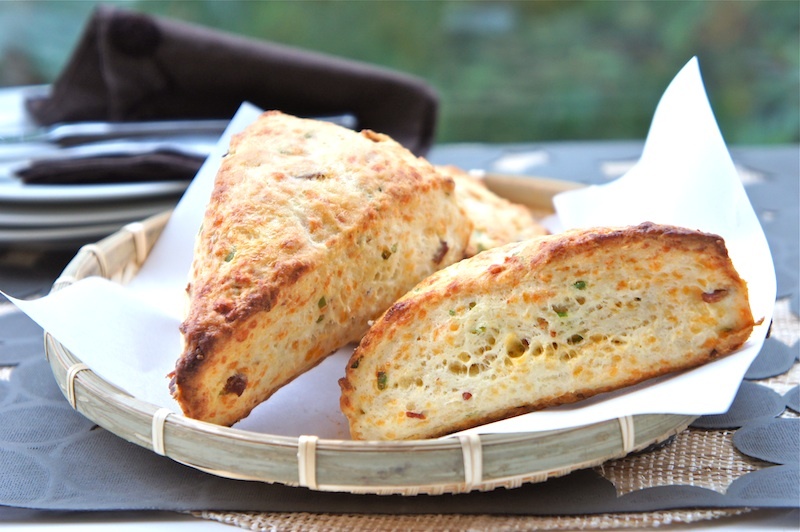 I added some chopped scallions, cheddar cheese, and bacon into the scones. 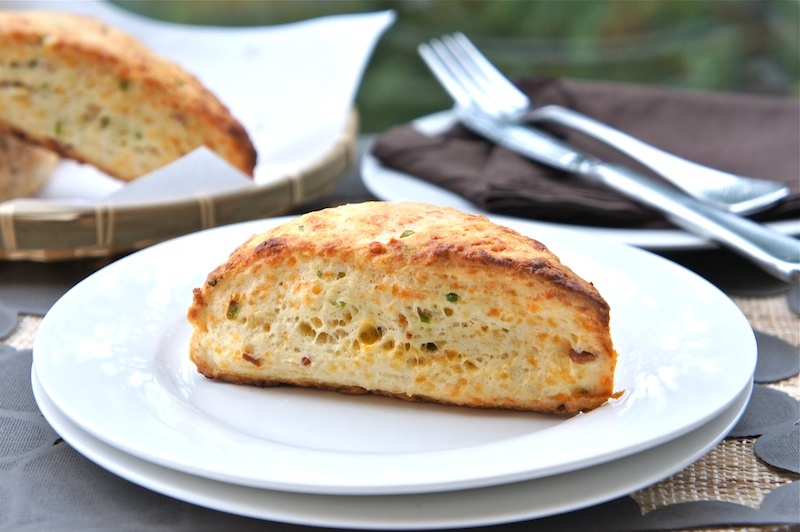 They turned out great - cheesy, savory, moist inside, and crusty outside! Kids love it! In a large bowl, combine the flour, sugar, baking powder, and sea salt. Mix the dry ingredients well with a whisk. Stir in the cheese, bacon, and scallions. Then make a well in the center and pour in the cream into it. On a lightly floured surface, pat the dough into an 8-½ inch round about ¾ inches thick. Cut into 12 wedges. Arrange the wedges on the baking sheet, leaving space between each one. Brush the tops with cream and bake until golden brown, 16 to 18 minutes. Let cool on a rack, and serve warm or at room temperature. Saw you on Elin's blog. Glad I checked out your blog. Lovely scones. Look forward to following your work. Ooooh, I love cheese scones!! These look awesome and scrumptious. Ohhhh my. Those look delectable. Mmm delicious! I love savory scones. Wow... nice work with the recipe "tweaking" because these scones look delicious! do you think milk would be ok to use?? might have to go out and get some cream just for this! Sounds and looks wonderful! I've been baking only sweet things recently, and I'm thinking of switching to savoury things next week! Thank you for a great recipe - will try it soon! I just made these, using milk instead of cream, and they taste excellent!